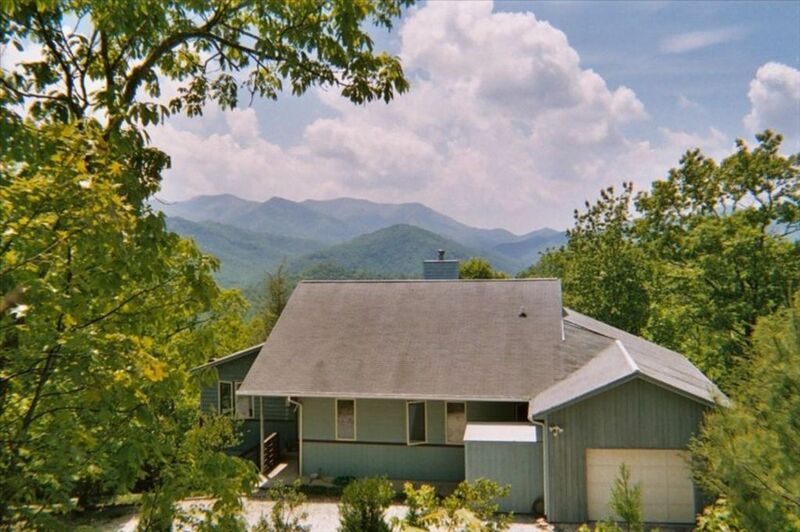 View the majestic Nantahala Mountains and beautiful Nantahala Lake from this gorgeous, very private, top of the mountain executive home. At 4200 feet, there are no obstructions to a breathtaking 240 degree view of the surrounding mountains and forest, and serene mountain lake below. A large cantilevered deck runs the length of the house, hanging over the side of our mountain. Suitable for outdoor dining and relaxing, some guests never leave it! Indoors, relax in a magnificent, yet intimate, space highlighted by 20 foot ceilings and huge windows on three sides of the house. Red oak floors throughout. Private master suite with double sinks, heating and large glass shower. Cozy modern den is great for reading or watching satellite flatscreen TV. Wonderful indoor entertaining possibilities in greatroom with fireplace, dining area, and comfortable, spacious living area. Fully complemented kitchen complete with breakfast area for two, with unobstructed view of the Nantahala Mountain Range. House all on one level. NO SMOKING and NO PETS. for all those starry nights. Raft the Nantahala, Ocoee, Chattooga, French Broad and more nearby. This is a perfect base for the outdoor enthusiast! The nearby communities of Murphy, Andrews, Franklin, and Dillsboro offer great shopping opportunities for antiques and original art. Lots of art shows and craft fairs in the nearby mountain communities throughout the spring, summer, and fall. I'm a person who values privacy, quiet, contemplation and nature. My friends are for life. Having sold a small retail food business, I now own a small garden design/installation business which is the thing I have always wanted to do. As a state certified master gardener, I also volunteer my time in many ways and in many communities. I split my living year between Atlanta, GA and MountainView House, where I hope to live full time one day. I enjoy most outdoor activities, but especially, hiking and bird watching. I'm an avid reader of history, natural science and literary novels and journals. I'm learning to use my telescope more effectively. I was once addicted to Breaking Bad and The Wire (probably still am) and I really enjoy well written serious dramatic as well as seriously funny TV and movies. I'm a native of Chicago and return often to the suburbs there to visit my mom (she's 98 :) who lives independently in the home my dad built in Northbrook, IL. I hope to stay active and independent all my life and I believe that the key to that is to always enjoy and have fun at what you do even if you could make more money doing something else. I bought this beautiful place after spending a July 4 weekend in the Snowbird Mountains and seeing only 1 other person on the lake there. I began searching a bit farther south in The Nantahala range of the Smokies, where there were/are even less people, although after 18 years, there are a few more folks who have caught on to this magic place. After two years of searching, this home came on the market and my realtor called me to come up and see it, even though it was for sale at a price higher than I had budgeted. One look out the western windows and I knew, THIS IS IT. I made an offer that day and have never looked back for the past 20 years. For me, it's not even the house, it's the place, itself, where I always feel closest to nature and her living things. The scene is always changing and always beautiful and haunting. There is always peace to be found here. My home is situated on two (mostly vertical :) acres at the top of a mountain. Most of my very few neighbors are seasonal, but I live here on and off, year 'round. It is the incredible quiet and peace that I find here and yet I am only 140 miles from my home in Atlanta. I feel that The Nantahala is another country entirely, so close to Nature as it is and rugged enough that not that many people live here. I also enjoy the face that the road leading to my home is like a private driveway, really, and when the trees are in leaf, you would never know my home was there. When the trees are bare, my home is more exposed, but the mountain views are so much more dramatic! The spring and late fall are wonderful times to visit for this very reason but not many people take advantage of this fact and so I happily return for longer visits, especially in November, when it is still fairly warm and in the spring during bird migration. This is definitely a spot for serious birders or for anyone who enjoys the color and song of migrating birds. Also, bald eagles have returned to the lake - a wonderful indicator of a healthy environment. Travelers should know that this is not a rental property per se, but a private property that is sometimes rented. Therefore, my guests will find quality furnishings and art and probably things that I should not display because of their portability. I believe in trust and the honor system, though, and have found through the years that most people are honest and trustworthy which gives me great hope. I have been disappointed only 3 times in 18 years and I consider that a good record. Guests need only behave as they would in their own homes to have a good experience for themselves and for me. Home is at top of mountain above Nantahala Lake. Partial lake view. Best view of Nantahala Range in the area. Home is at highest elevation in area on two mountain top acres. Landline for guests' use, if cell service is weak or interrupted. Appalachian Stove. Will warm entire house if power fails. Large flat space at front of home provides parking for several cars. Effortless connection - log in and go! Separate range top, with microwave above. In wall oven large enough for roasting a turkey. Has all the latest features. Quality cooking pans from Farberware and Calphalon. Please handle accordingly! DO NOT but Calphalon in dishwasher. Basic Mr Coffee REALLY basic, just on and off. Does not turn itself off! Available for guests' use if containers HAVE BEEN OPENED, such as salt and pepper, spices, oils and vinegars. Stocked as if it were your home. All amenities including espresso/cappucino maker, large crock pot and Cuisine Art. Also 2 seats at breakfast bar under large west-facing window. I'm an avid reader with many books for your use. 2 seat Mohawk fiberglass canoe with cushions, backrests and life jackets. Trex deck cantilevered 30' over southwest side of house. Extends along main body of house. Thrilling views of Nantahala Range and partial views of Nantahala Lake below. Beautiful sunsets always. No stairs, home on one level. However, the entry to the master bathroom was not built to code. It is more narrow than it should be and will not accommodate a wheelchair. Also, 2 stairs up to front door. My home is located at the top of a mountain in a sparsely populated area, The Nantahala, above Nantahala Lake. The primary view is of the Nantahala Range. Groceries and hospital are at minimum, 15 miles from home. I always shop for groceries before I drive up-Ingles in Franklin, Murphy and Andrews. WalMart in Murphy or Franklin. Small local store at lake sells basics at elevated prices. My pantry is stocked with basics, should you forget spices, etc. My home is centrally located for hiking (AT and Bartram) and birding (Audubon Important Bird Area or IBA), lake access dock is 1.5 mile down the mountain. Small restaurant is 1.5 miles on lake, Lakes End Grill.